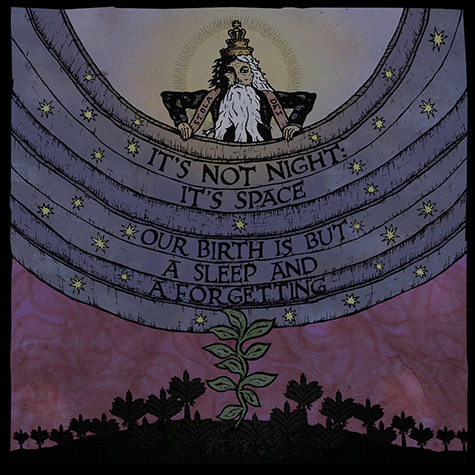 Our Birth is but a Sleep and a Forgetting by IT's NOT NIGHT: IT'S SPACE came out mid-June via Small Stone Records and found its way to my ears thanks to a series of shows the band will be playing this month starting tonight in Boston. And there is a Philly stop at the Kung Fu Necktie. I'd recommend giving this album a listen because it's better than watching the news. Well, that and you're likely to be on board if you're into Hawkwind, Grails, and Om. It looks like vinyl copies of the album are out of stock, but CDs and downloads are still available if you want to own this after giving it the virtual spin via the embedded Bandcamp player below. All links and tour info are brought to you courtesy of Earsplit PR. Dark psychedelic space rock instrumentalists IT'S NOT NIGHT: IT'S SPACE will kick off their first round of dates of the new year. Beginning tonight in Boston, Massachusetts the band's (((Win-Tour 2017))) excursion will wind through five states and eight venues, with additional performances to be announced in the coming weeks. IT'S NOT NIGHT: IT'S SPACE will be touring in support of their Our Birth Is But A Sleep And A Forgetting full-length released via Small Stone last year. Recorded, produced, and mixed by Rick Birmingham at Castle Alamut and The Tin Roof Studios and mastered by Chris Goosman (Acid King, La Chinga, Solace, Lo Pan, Freedom Hawk etc.) at Baseline Audio, the intoxicating, six-track offering is available worldwide on CD and digitally. Stream and order the record at the official Small Stone BandCamp page HERE. Gushed The Hudson Valley Almanac Weekly of the offering, "There are certain kinds of psychic transport only attainable by lingering on a drone or a single pattern long after the modern mind has expressed its desire to move along, and that place is where INN:IS lives but this band has become nothing short of masterful at the art of the narrative arc as well, and that's important for an instrumental band. Jams that transfix live can just bore in the studio if a band is not taking its storytelling responsibility seriously." "Our Birth Is But A Sleep And A Forgetting is a surprising little journey through the psychedelic cosmos of the stoner and ambience world," wrote Apochs.net. "IT'S NOT NIGHT: IT'S SPACE does a superb job casting various settings... leaving the listener at their mercy through soothing astral voyages with or without the aid of hallucinogenic drugs of some kind. Between solid musicianship like what's found on 'The Beard Of Macroprosopus' and the emotionally charged sensations felt on 'Across The Luster Of The Desert Into The Polychrome Hills,' it's plain to see that this three-piece is not your everyday instrumental act." "Beaming in from cosmic depths with six tracks... Our Birth Is But A Sleep And A Forgetting offers sonic immersion and atmospheric scope in kind with a patient, hypnotic front-to-back flow that adds rich tonality to what guitarist Kevin Halcott, bassist Tommy Guerrero, and drummer Michael Lutomski accomplished their first time out," offered The Obelisk. "Parts may have been born of improvisations, but the finished product doesn't feel like a collection of jams. Rather, a series of interconnected pieces correctly positioned to guide the listener through this aural expanse. Spiritualism, contemplation, philosophy, space itself - all of this seems to be in play for IT'S NOT NIGHT: IT'S SPACE." Outlaws Of The Sun concurred, "The album sounds incredible through-out. The production is first rate as you feel emotionally connected to the music from the very start. Our Birth Is But A Sleep And A Forgetting is simply an album that will not only be considered as one of the year's best instrumental rock albums but perhaps one of the best albums of the year." Added More Fuzz in their year-end review, "The name of the band gives two clues about their music, first that it's space (rock), believe them, they know. Second, its length suggests post-rock influences, and there's definitely some post vibe in the way the songs progress smoothly towards their apex, with noisey melodies becoming gradually faster and angrier through time. You'll probably feel a drone aura also, because this trio knows to take its time to do it right. Don't worry, you won't have to do a thing, just lay back in this comfy capsule drifting through the cosmos." Guitarist Kevin Halcott and drummer Michael Lutomski founded IT'S NOT NIGHT: IT'S SPACE early in 2010. By that Fall, Tommy Guerrero had joined on bass and their first EP arrived in October 2011. East Of The Sun & West Of The Moon featured three epic instrumental pieces that set the tone for what to expect from IT'S NOT NIGHT: IT'S SPACE. Positive response came in virtual and physical realities, and the band set about honing their craft, averaging about fifty-sixty shows a year. Momentum carried IT'S NOT NIGHT: IT'S SPACE straight into their first LP, 2012's Bowing Not Knowing To What, self-released with the help of successful crowdfunding raising $5,000 to press CDs and vinyl. It was this album that caught the attention of Small Stone Records. A series of roadblocks and personal setbacks following that release album set the tone for their second album, the soon-to-be issued Our Birth Is But A Sleep And A Forgetting. In moldy warehouses, grimy basements, and the dusty backrooms of pizza shops, the psychedelic drone trio channeled new material and worked tirelessly to craft the songs that would become a definitive offering. It became a full-time task. Our Birth Is But A Sleep And A Forgetting rings both familiar and fresh. Longtime fans should have no trouble getting down with the heavy grooves and climaxes of these sonic journeys, but the band has pushed into dreamier territories as well. The long wait to share this very personal and powerful album is finally over, and IT'S NOT NIGHT: IT'S SPACE is ready to get back on the wave and ride it forward.